Was there a game or something today? Ha. The years that I was living in the UK, I became a bit disconnected from the Super Bowl hype. The game is on tv in the UK but it is on in the wee hours of the morning and we didn’t get the commercials. As we all know, they are the real reason for watching the game. I would still stay up and watch it, sometimes with a bewildered British friend, and the junk food portion of the tradition alive. This year, I watched the game alone. Chris was down visiting me this weekend but he had to start his journey home before the game started. I wanted to get some junk food time in but I didn’t want to cook a bunch of stuff just for me. Nachos came to mind but it was Super Bowl day and I didn’t want to do a normal nachos. Somehow, my drunken sloppy Joes recipe came to mind. Years ago, they came out of a drunken meatballs recipes that I used to make. On a particularly lazy day, I couldn’t be bothered to make meatballs and it became a sloppy joe recipe instead. It became a go-to recipe for whenever I had friends over to my London apartment. 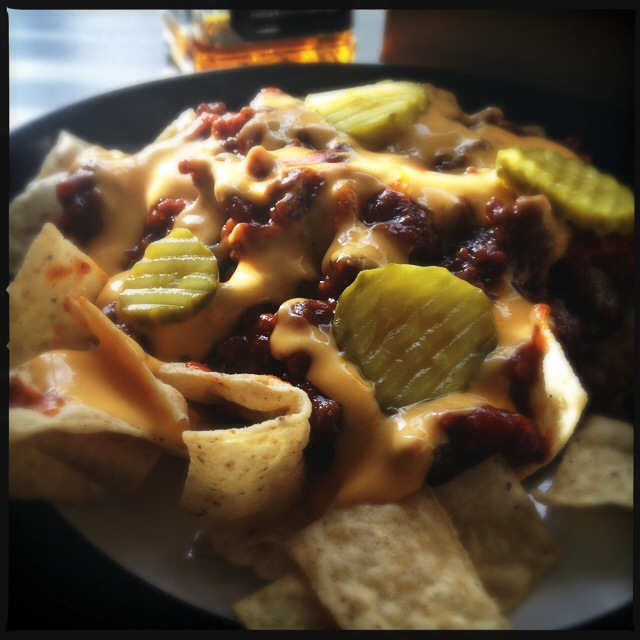 I thought it would probably taste good on top of tortilla chips and smothered with cheese and so the Drunken Sloppy Joe Nachos were born today. Really, it is a non-recipe, other than the sloppy Joes nothing is cooked or has to be measured. You pile chip on a plate and put the toppings on. 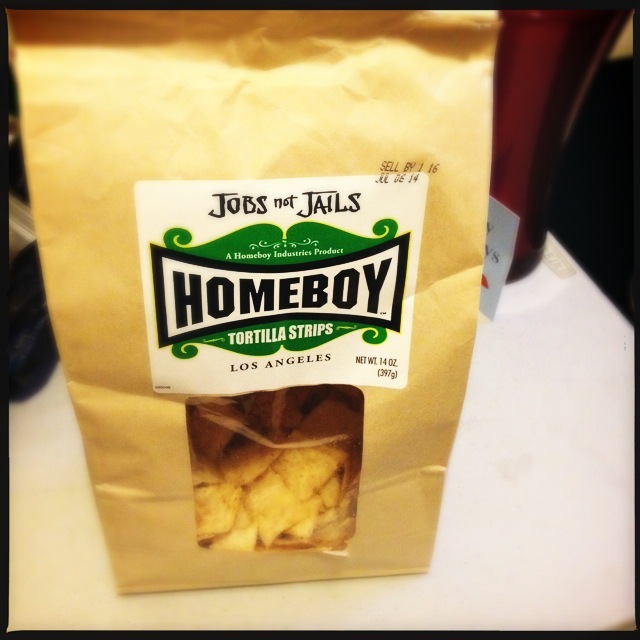 For the chips, I went with the Homeboy Industries tortilla strips. They are a charity that teaches former gang members culinary skills and gives them the hope of a productive and honest work life. Their bread is really good and can be found at most Los Angeles area farmers markets. My supermarket carries their tortilla chips and salsas. Not only do they taste good but I feel like I am giving a bit back to an organization that is working to make my city a better place. For the cheese, I just went for a jarred nacho cheese sauce. Meh, I just didn’t feel like going fancy. At the last moment, I threw some pickle slices on top. The acid actually worked against the salty aspect of the chips and cheese. Put the chips on a place. Spoon the drunken sloppy Joe mixture on top of the chips. Smother with cheese and throw on the pickle slices. Eat. Heat the olive oil in a large and deep pan. Add the onions and fry gently until they have started to go tender. This takes about 5 minutes, stirring often. Crumble in the ground beef and cook, stirring when needed, until all of the meat is browned. This took me about 8 minutes.Add the ketchup, Southern Comfort and brown sugar and stir until everything is combined with the meat. Bring to a boil and then reduce to a simmer and continue to simmer for about 15 minutes, stirring now and then. Stir in the Dijon mustard and then let simmer for another 15 minutes or until the sauce is the thickness you like with a sloppy joe. This entry was posted in Home Cooking and tagged Beef, Junk Food. Bookmark the permalink.